UPPER RIGHT: Colour forms from Philippines (upper) and Red Sea (lower). PHOTOS: Erwin Koehler. BELOW: Yellow colour form, right photo showing start of swimming sequence. Fungu Yasin, Dar es Salaam, Tanzania, February 1979. PHOTOS: Bill Rudman. 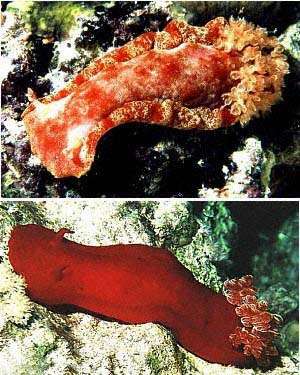 The species was first described from the Red Sea and based on a red colour form. The mottled form (Philippines photo) is the most common colour form, although yellow animals have been reported from Hawaii and here from Tanzania. Thanks to Erwin Koehler for the upper two photos. Apart from being able to swim, Hexabranchus is an unusual member of the Superfamily Eudoridoidea in that its gills do not have a gill pouch into which the gills can retract. Also each gill is inserted separately into the body wall. 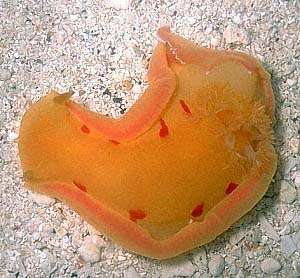 Hexabranchus sanguineus is one of the largest of all nudibranchs with animals being recorded at over 40cm in length. See Wayne Ellis' photo of an animal swimming. See References on biology and natural history. See Hexabranchus sanguineus Page 2. Hexabranchus sanguineus and purple ink? 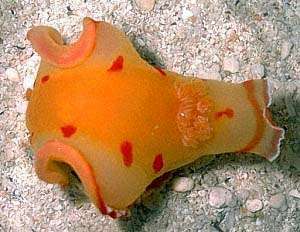 Hexabranchus from the Solitary Islands. How do Spanish Dancers reproduce?